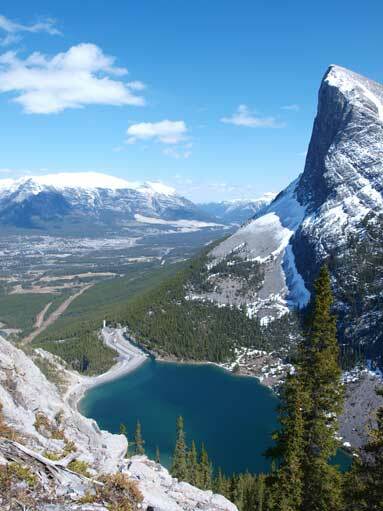 The East End of Rundle wasn’t my plan for the day though. My original plan was Mt. Haffner in Kootenay National Park, but when I arrived there, the isothermal snow condition turned me around right away. 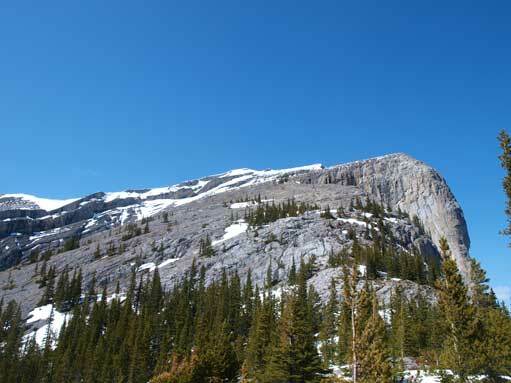 It was 3 pm and that’s certainly not a good time to start a snowshoeing trip in May… I didn’t want to waste a bluebird day in the mountains so I drove back to Canmore and hopefully bag a smaller peak. 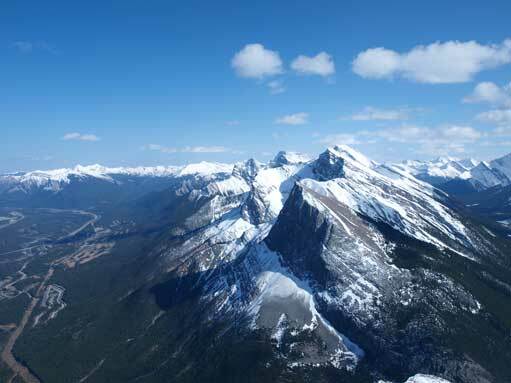 East End of Rundle is certainly one of the shortest ascents in that area, among the most popular and well documented in Alan Kane’s Scrambles in the Canadian Rockies. After driving up the rough and dusty Smith Dorrien Road I parked at Whiteman’s Gap and looked for a man-made trail. The trail was very steep but it did bring me up high quickly. The forest was not thick so I got some good views towards Ha Ling Peak and Goat Range on the way up. At the treeline, you can either aim for the skyline ridge on your right, or scramble up a steep slope followed by a rock band, directly aim for the summit. 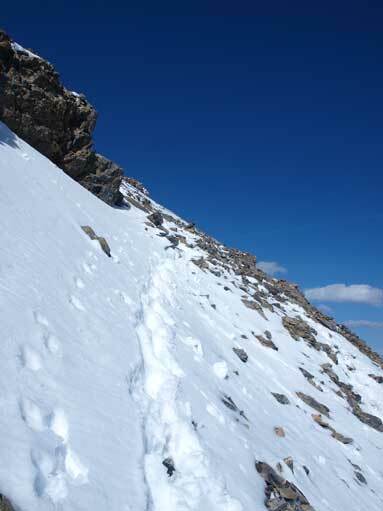 At this elevation, there were still lots of snow, so I followed other scramblers’ tracks aiming for the rock band. When dry, the band is very straightforward. But I had to deal with wet snow covered slabs. It didn’t impose too much of a problem but the wet condition surely made me being suspicious about the foot holds. I couldn’t trust the grips sometimes. After the rock band, it’s only 5 min away from the summit. 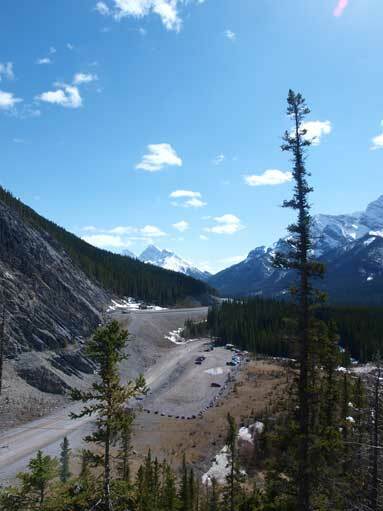 A look at Ha Ling parking lot. It wasn’t that busy considering it was a sunny afternoon. Higher up I encountered the snowy condition. This is near the crux rock band. 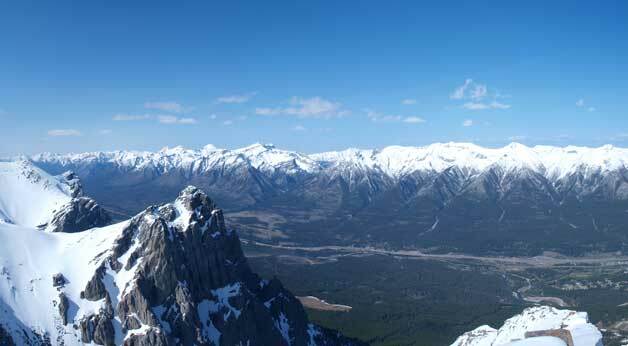 Looking up Bow Valley from the summit. Fairholme Range in the background. 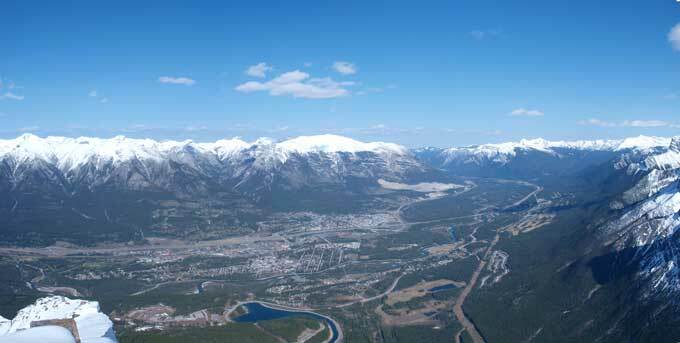 Looking down Bow Valley. 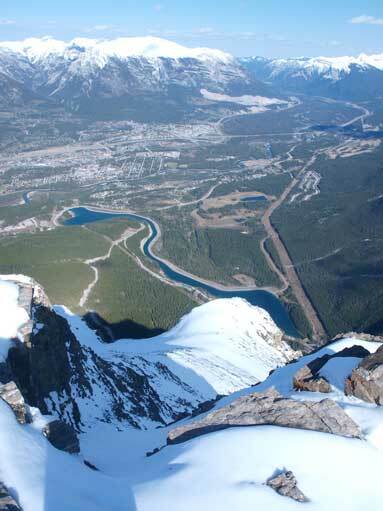 Canmore townsite below. 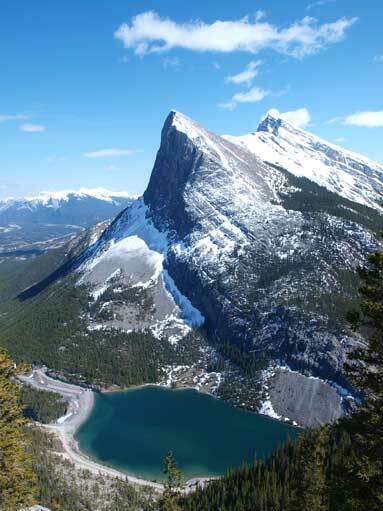 Ha Ling Peak is the pointy one in foreground. Lawrence Grassi just behind it. Looking up Spray Valley. 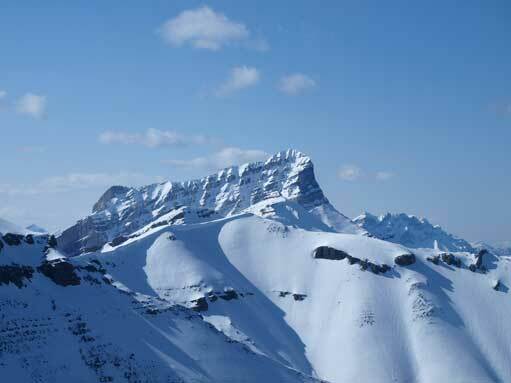 The big peak on left skyline is Old Goat Mountain. 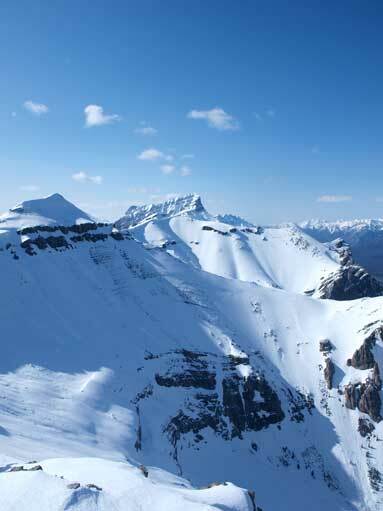 Looking across Goat Range towards West. I didn’t linger too long up there since it’s getting late in the day already. Coming back down through the rock band was even trickier thank to the wet condition… The trail on the lower part was steep so all the forces acted on my knees, and that was certainly not very pleasant, but I did make back in good time. 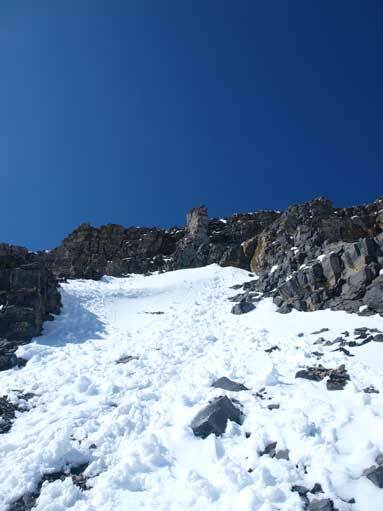 Time to go down, still had to deal with snowy condition near the crux. 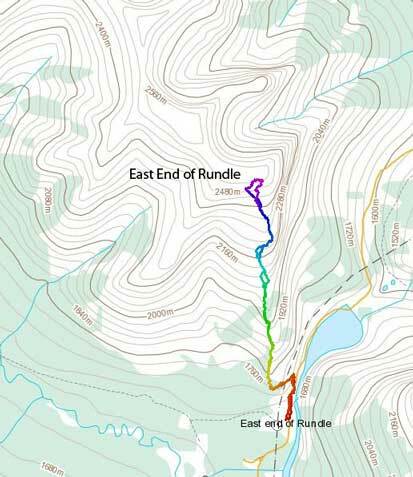 My round trip time was a mere 3.5 hours proving East End of Rundle to be indeed as short as I was expecting. 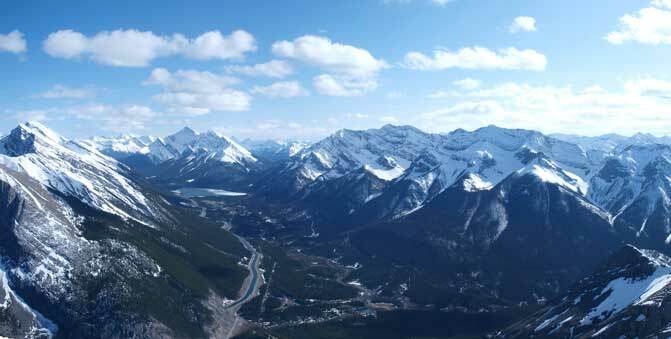 It’s a great off-season scramble objective and also a great one to introduce beginners to the mountains.